You can’t really blame him. I’d want a turn too, if I was always being ridden. Doodle #1,500! Can you believe it? This one special doodle goes to my niece Azure, who has waited far too long for her own doodle. 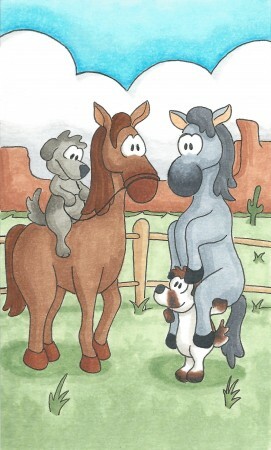 She requested “either horses or puppies,” but since I couldn’t make up my mind, I did both in one doodle.